Our current understanding of particle physics, known as the Standard Model, has been tremendously successful. Over the past 40 years, it has pointed experimentalists toward many a discovery, such as the Higgs boson in 2012. However, despite all of its triumphs, there are a few things that the Standard Model does not explain. One major missing piece, for example, is gravity. Although gravity is one of the four fundamental forces of nature, and we understand it well on the scale of stars, planets and galaxies, there is no working theory that can combine this understanding with the laws of particle physics. Another missing piece—quite a big one—is dark matter, thought to make up about 80 percent of the matter in the universe. Theorists have come up with a variety of ways to fill in the missing pieces, predicting the existence of several undiscovered particles and processes along the way. Scientists at the Large Hadron Collider are looking for signs of physics beyond the Standard Model, and they have ideas about what they might look like if they appear. The trained eye can spot when an event display is different from the norm, a clue that something unexpected and interesting is afoot. Let’s have a look at some theories of physics beyond the Standard Model and find out what they might look like in the detectors at the LHC. By observing the gravitational properties of stars and galaxies, scientists can tell that some invisible thing must be influencing our universe. Scientists call it dark matter, which many theories predict must be made up of particles that interact with other matter only through gravity. If scientists were able to find signs of dark matter particles at the LHC, it would be a huge step forward in our understanding. Here, we see a simulated event display showing what dark matter might look like in the ATLAS experiment at the LHC. The event display offers two views: one from the side and the other head-on. 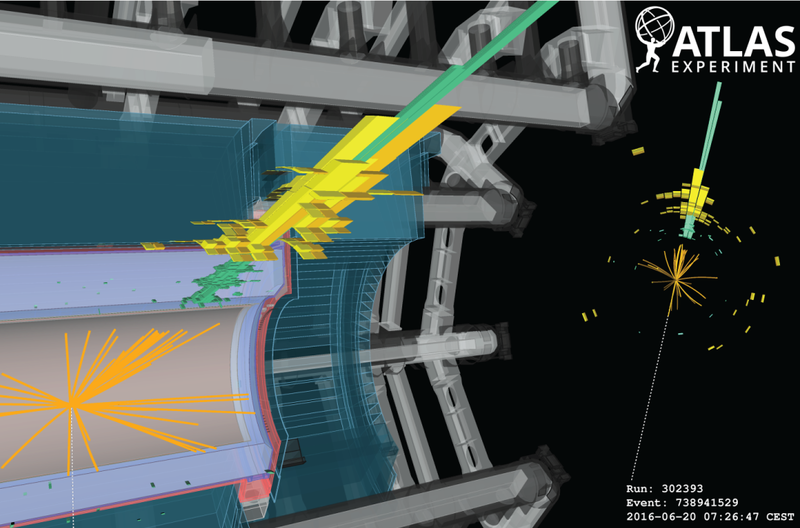 The intersecting orange lines show where the particle collision took place, and the other colored blocks show where particles deposited energy in different layers of the ATLAS detector. If we look at the head-on view on the right, we can see particles with a large amount of energy moving up and slightly to the right. The conservation of energy requires that there must be an equal amount of energy traveling away from the collision on the other side, but this event is unbalanced. This uneven event display suggests that something that we don’t see must be carrying away the extra energy (represented on the right by a white dashed line). The energy thief could be dark matter, passing through the detector without interacting. It could be that dark matter is made up of a single kind of particle. Or it could be that dark matter, like regular matter, consists of a whole collection of different types of particles. Theories that describe dark matter in this way are called “hidden sector” or “hidden valley” theories of dark matter. Hidden sector dark matter particles, like the dark matter particle simulated above, would pass right through a particle detector unnoticed. But if they traveled away from the collision where they were born and then decayed into regular matter particles, those particles would show up in interesting tracks on the event display. In the simulated event display from the CMS detector above, we see a signature that could indicate the existence of hidden sector particles. 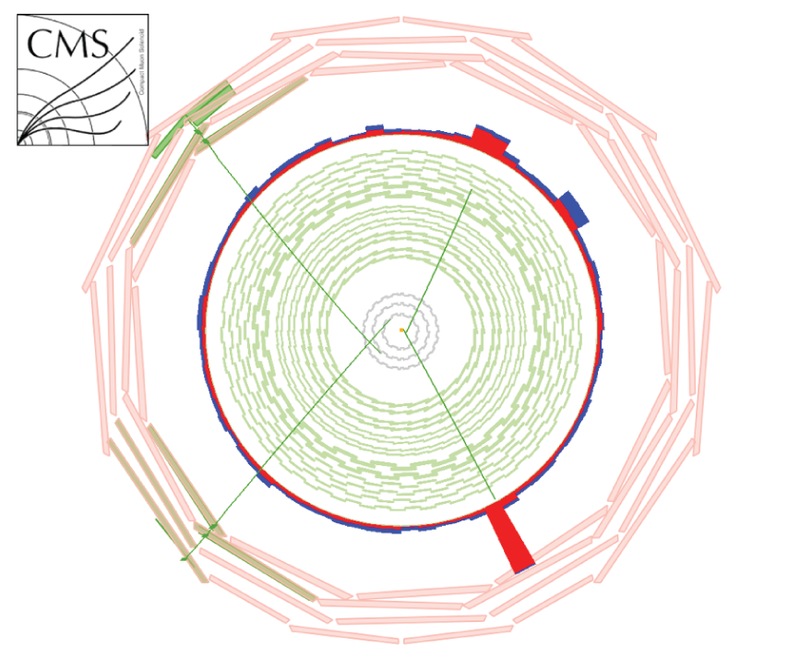 On the left, we can see the tracks of two particles called muons (in green). (Muons are the more massive cousins of electrons.) Their point of origin (where the lines cross) is a significant distance from the site of the original particle collision (the orange dot at the center). On the right side of the event we can see two electrons (the shorter green lines), which also seem to be coming from slightly to the side of the particle collision. This suggests that they were produced by a new unseen particle that traveled some distance away from the original collision before decaying into the observed particles. Each of the forces in the Standard Model has at least one associated force-carrying particle: The electromagnetic force has the photon; the strong force has the gluon; and the weak force has the W and Z bosons. But as mentioned previously, the force of gravity isn’t included in the Standard Model. If it were, it could be represented by a theoretical particle called a graviton. Very little is known about gravitons, but one thing scientists can predict is how they would decay. When a graviton is produced, it should immediately transform into two Z bosons, which in turn should decay into other pairs of particles. 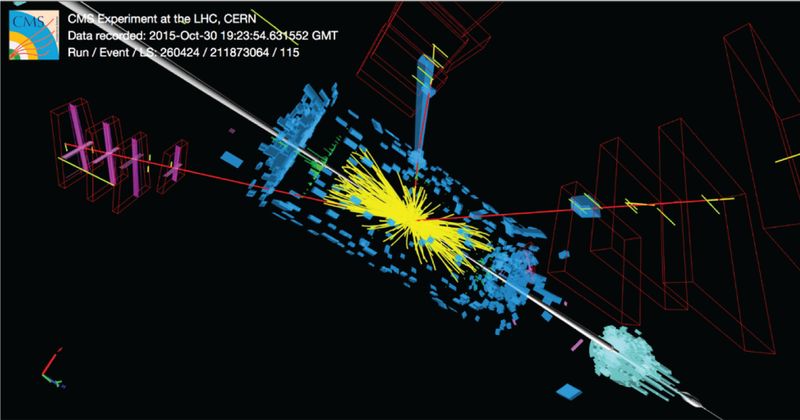 The picture below shows a simulated graviton event from the CMS experiment at the LHC. 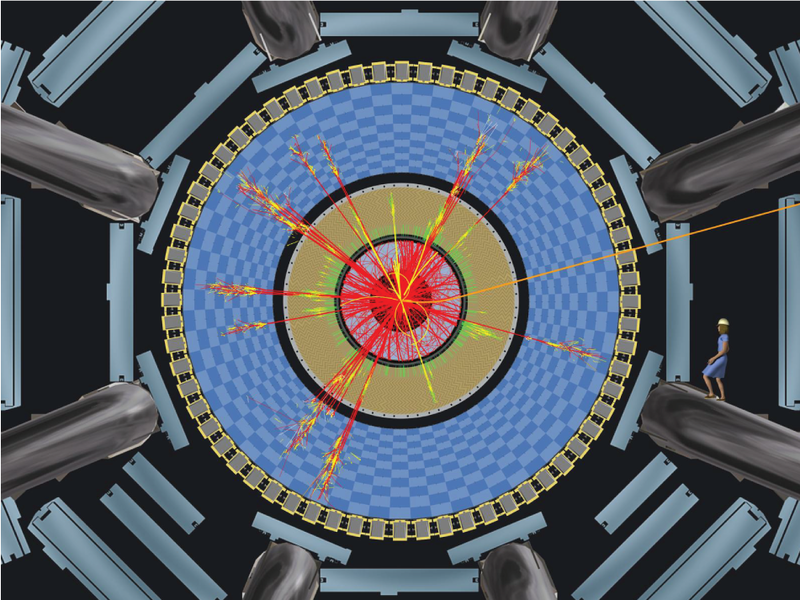 In it, one Z boson decays into a pair of muons (the two red lines on the left), and the other decays into a spray of particles known as a “jet” (the several red and blue bars on the right). From these decay products, we can reconstruct the mass of the original particle that produced the two Z bosons. An observation of a single event like this would not by itself be evidence of a graviton, because other known processes could produce two Z bosons. However, if scientists saw a large number of events like this and could reconstruct them to show that they all came from a particle with the same mass, that would be strong evidence for a new particle like a graviton. Gravity is tricky for particle physicists. It’s just so different from the other forces scientists know. Compared to electromagnetism, the strong force (which holds protons and neutrons together in our atoms) and even the weak force (which mediates radioactive decay), gravity is incredibly weak. One explanation why gravity is so strange is that it could be operating in more than our three known dimensions of space. If gravity is actually stronger than it seems and is simply being dissipated over unseen additional dimensions, scientists predict that they should be able to use the LHC to create miniature black holes—tiny objects with enough concentrated mass or energy to have an escape velocity higher than the speed of light. Like the particles produced in LHC collisions, these would quickly evaporate—in this case into a burst of smaller particles. The above image is a simulated black hole decay in a collision in the ATLAS detector. What makes this distinctive is that there is so much going on: The event display is an eruption of electrons, muons and particle jets. The sheer volume of particles is a strong indication that something new might be happening. Another way to infer the existence of extra dimensions would be to see particles leaking from them into ours. 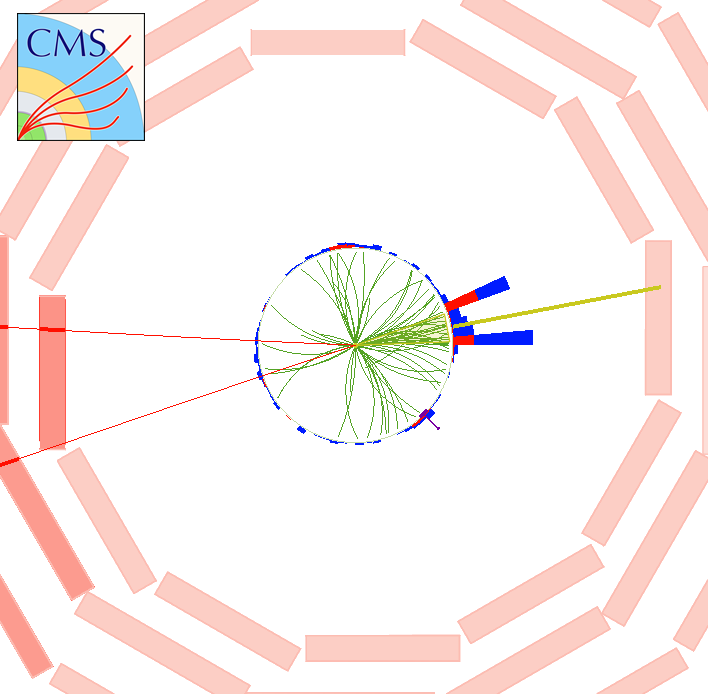 The simulated event display from the CMS experiment below looks deceptively simple: The main features of interest are the two muons (the red lines) passing through the detector on the left and right of the display. However, what makes this display interesting is that when scientists reconstruct the mass of the parent particle that decayed into these muons, it adds up to more than 10 times the mass of any known particle. Particles leaking in from extra dimensions could produce more muon pairs with a higher reconstructed mass than regular proton collisions in the LHC could. If we saw a significant number of events like this with a larger mass than expected, it would be a strong indication that new physics is at work. This gallery only scratches the surface of what new physics might look like at the LHC. Every day, scientists propose new theories that could produce even stranger looking events. And of course, a single event alone is not enough to confirm or disprove a new theory; scientists would generally need to see many such events to make the case that something unexpected is going on. That’s why the LHC continues to collect mountains of data and will soon undergo upgrades that will have it smashing particles at a rate 10 times higher than originally designed. Every collision is a chance to see something new.